I have long had a rather bizarre fascination with the inside-the-park grand slam. It has forever eluded me. I’ve seen Albert Pujols hit three home runs in a game, I’ve seen Melky Cabrera hit for the cycle, and I’ve seen Randy Johnson and Zane Smith flirt with no-nos. Yet not in person, not even from my couch — the sacred place from which I have witnessed so many of civilization’s miracles — have I seen the elusive ITPGS. Anyhow, Wikipedia, which is an unassailable source of true facts, tells me that there were but 40 ITPGS’s through 2007. Then this thread from 2002 lists them. It’s on the Internet, so I assume pristine accuracy. – Honus Wagner hit five ITPGS’s in his superlative career. Five. I declare: that’s a lot. – What I find to be more amazing is that teammates Joe Kelley and Jimmy Sheckard each hit one in the same game in 1901. – Then Sheckard went and hit another one the very next day. – Bombo Rivera hit one in 1976. Bombo Rivera is such a great name that all of God’s children should be named Bombo Rivera. 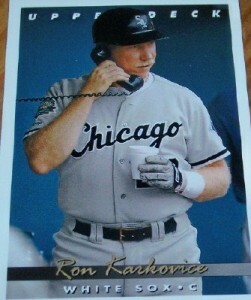 – And here’s what gobsmacks me the most of all: Ron Karkovice — Ron Slapping Karkovice! — somehow pulled off an ITPGS in 1990. Kark was slower than a Bergman film, so I can’t rightly fathom the absurd tapestry of events that led to his clumping around every base and then, I am forced to assume, collapsing face first onto home plate. I would give up multitudes to have been there. So what’s the coolest baseball event you’ve ever witnessed in person? We hoped you liked reading The Inside-the-Park Grand Slam: An Appreciation by Dayn Perry! I saw the Mel Stottlemyre ITPGS in 1965. The old Yankee Stadium was 461 feet to deepest CF and the Red Sox CF was playing shallow – Mel hit a line drive directly over his head (don’t remember who the CF was) and it rattled around the monuments out there (in those days the monuments were in CF as part of the playing field) and I don’t thing there was even a play at the plate. Best event I ever witnessed in person, however, was not part of a game – it was Willie Mays Night at Shea Stadium – I was all the way back in the upper reaches of the upper deck, but Willie came through loud and clear. I’ll never forget it.